Pretty much all shows around the country pivot off aspiring locals. Their fans keep local box offices in business. It starts, more often than not, with local rivalries. This is the flavor that neighborhood box offices most savor. Whether local circuits become dead ends for professional career development depends – by the same token – just as much on the gate keeper’s fortune as it does on the fighter’s fate. Pedro Gonzales (Redline Fight Sports in Quincy, Massachusetts) def. Nick Chasteen (Best Muay Thai in Tempe, Arizona) by TKO at 2:43 from Physician Stoppage in Round 2. Professional 148 lbs. Men. Scheduled for 5 x 3 Rounds. Photo by Bennie E. Palmore II. Because box office fortune hyperlinks so often to fantasy in the probability distribution of cottage industries like ours, so also is it rare for aspiring locals to develop their reach beyond the grasp of home town celebrity. What makes all the difference – without dimming the head lights on what is sometimes road kill – is whether gate keepers steer destiny’s children towards on or off ramps in their career paths. 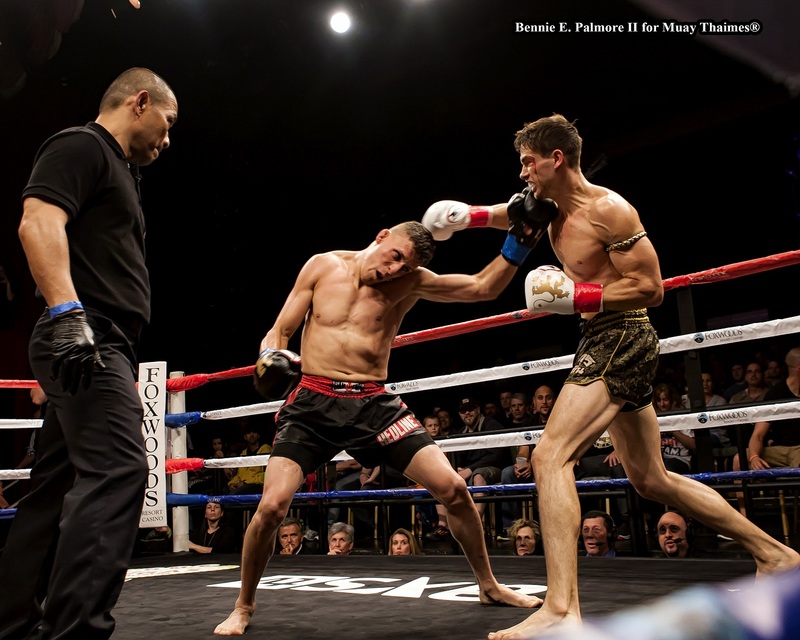 Smack in the middle of The New England Throughway’s stretch of I-95, Lion Fight’s new destination at Foxwoods is now an on ramp to full rules Muay Thai in the Northeast Corridor. With Las Vegas based Lion Fight’s May 23rd debut at Foxwoods Resort and Casino, for the first time full rules Muay Thai has a national showcase, not unlike the UFC’s and Glory Sports International’s (GSI’s) road tours. Mohammed Lemjerdine (Sitan Gym in Astoria – New York City) def. Jason Andrada (Fight Capital in Las Vegas, Nevada) by Unanimous Decision: 48-47, 48-45, 50-46. Professional 125 lbs. Men. 5 x 3 Rounds. Photo by Bennie E. Palmore II. Not since Kaoklai Kænnorsingh and Sænchai Sinbimuaythai head lined in Los Angeles has a box office tested the unique selling proposition that none of us would be here, if someone hadn’t set his (or her) compass on the horizon. Lion Fight’s founder and CEO Scott Kent began moving in that direction, when he featured Lumpini stalwart Sittisuk Por Sirichai vs. Kevin Ross on February 12, 2011. Kevin Ross (left) def. Chris Mauceri. Photo by Bennie E. Palmore II. If you trace our family tree back to the Marquis of Queensbury, Kevin’s entire career makes a pretty convincing case for “it’s not whether you win or lose but how you play the game”. What Kevin proved the way he plays this game – then and now – you’re really settling for artificial flavoring with GSI’s adaptation of K-1 vs. full rules Muay Thai done well. Kevin Ross (Combat Sports Academy in Dublin, California) def. Chris Mauceri (Black ‘n Blue MMA in Kingston, New York) by TKO from Physician Stoppage at 0:21 in Round 3. Professional 142 lbs. Men. Scheduled for 5 x 3 Rounds. Cosmo Alexandre (right) def. Mark Holst. Photo by Bennie E. Palmore II. In a sport where you learn from your mistakes, the one Cosmo Alexandre most regrets was leaving it to the judges in s Las Vegas vs. Sakmongkol Sitchuchoke on August 20, 2011. When the WBC’s #1 ranked middleweight in the world comes to avenge injustice, Mark Holst probably should consult his scriptures for the part about a sacrifice. Fortunately for the Canadian, the legendary Coban Lookchaomaesaitong was the third man in the ring. He remembered that “the course of justice…doth teach us all to render the deeds of mercy.” (William Shakespeare, “The Merchant of Venice”, Act IV, Scene I) Cosmo Alexandre (Blackzilians in Boca Raton, Florida) def. Mark Holst (Ottawa Academy of Martial Arts in Canada) by Unanimous Decision. Professional 160 lbs. Men. 5 x 3 Rounds. Tiffany Van Soest (left) def. Lucy Payne. Photo by Bennie E. Palmore II. Lucy Payne came for redemption – if not vengeance – in her trans-Atlantic rematch with Tiffany Van Soest, whom Jake Burke depicted presciently as “a little pit bull”. If you get too close to a pit bull, she’s apt to rip you apart. That’s exactly what happened. Tiffany Van Soest (Blue Ocean Muay Thai in San Diego, California) def. Lucy Payne (Touch Gloves in Penzance, Cornwall, United Kingdom) by Split Decision: 50-46, 45-50, 49-46. Professional 126 lbs. Women. 5 x 3 Rounds. A source reports that the dissenting judge in this split decision copped a plea afterwards to dyslexia with the score cards. We can only hope this desert dysfunction isn’t becoming contagious. See Bridge Over Troubled Waters. No local rivalry sells more tee shirts than Boston vs. New York City. Located about midway between these two urban power punchers, Foxwoods Resort and Casino couldn’t be in a better place to corner the market potential for full rules Muay Thai where it’s most concentrated on the American landscape. Setting his compass on the horizon, the odds look good for Scott Kent’s gamble here to hit the jackpot. CLICK HERE for Bennie E. Palmore’s entire Photo Gallery. This entry was posted in News & Results and tagged Chris Mauceri, Coban Lookchaomaesaitong, Connecticut, Cosmo Alexandre, featured, Foxwoods Resort Casino, Glory Sports International, K-1, Kevin Ross, Las Vegas, LION FIGHT 10, LUCY PAYNE, main featured, Mark Holst, Marquis of Queensbury, Most Featured, Muay Thai, Northeast Corridor, Sakmongkol Sitchuchoke, Tiffany Van Soest. Bookmark the permalink.